On the outskirts of Exmouth in Summer Lane there is a "quaint" show house which has a strange history of its own. 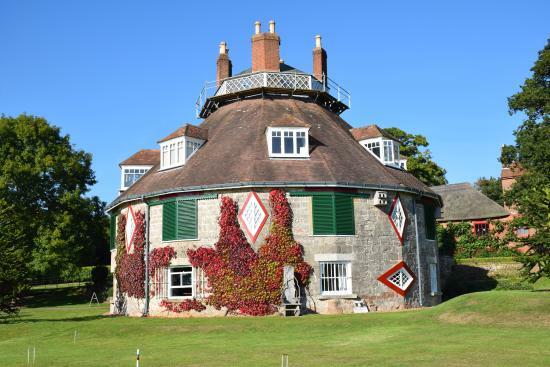 Two local wealthy but rather eccentric ladies Jane and Mary Parminter erected this home called "A la Ronde". The Parminter family were all honoured in North Devon as far back as 1600 and had acquired considerable wealth as merchants. Miss Jane Parminter had resided for some time in Portugal and spent much time from 1784 visiting the principle countries of Europe with her orphaned cousin Mary. In 1795 the two ladies decided to reside in Devonshire, and negotiated for fifteen acres of land near Exmouth. They lived rather eccentric and secluded lives for many years until Miss Jane died in 1811. They were regular attendants at the Glenorchy chapel in Exmouth but as they got older they found the journey to the chapel, particularly in winter, extremely difficult. They therefore decided to provide facilities for private devotion on their own estate. Thus the chapel of Point-in-View came into being. A la Ronde is (surprise) a circular building copied from the Church of San Vitale at Ravenna. The rooms radiate from a central octagonal hall sixty feet in height above which is a shell gallery. The wall and staircase are covered in thousands of shells in quaint and various beautiful designs, which was the work of the Misses Parminter. Many years ago instead of renewing the thatch a slate roof was substituted and when the first German raids were made early in the war incendiaries were dropped onto A la Ronde. Nothing could have save the house had it been thatched. Although Miss Jane died in 1811 the work continued and the buildings were completed later that year. The chapel was surrounded by a small school for six girls and almshouses for four maiden ladies aged over 50, with accommodation for a minister. The almshouses and chapel are said to be the only one of its type in the Country. It was a condition that the women would be of good character for religion and morality as well as being possessed of some small independent property. One of the ladies was to act as a school mistress to six poor female children. Although non-Jewish the two ladies evinced a lively interest in the conversion of Jews to Christianity prior to their return to the "Promised Land" and this was made very evident in the deeds for it was expressly stated that in the case of Jewess who had embraced Christianity becoming a candidate for a place at the almshouses she was to have preference over all others. The children of Jewish parents were able to have preference over all other in the school. The school closed in 1901 as it failed to meet the standards of the Education Act of that year." Services are still held regularly at the chapel that is governed by trustees, the minister still receives a salary and there are four women occupying the rebuilt dwellings. Inside the chapel are the words "Some point in view - We all pursue". Christenings were held at The Point-in-View Chapel and were recorded from 1829 they are included on the IGI. Robin Bush. The Book of Exmouth. ISBN 0 86023 057 0 Barrucuda Books Ltd.